A tour dedicated to the discovery of the cultural and historical contrasts of this cosmopolitan city where East meets West. Experience the rich cultural heritage and historical contrasts of Durban on your KwaZulu Natal holiday with day tour. A tropical beach city where East meets West, Durban is the perfect South African holiday paradise, boasting a veritable melting pot of culture and intrigue. On your Durban vacation, discover this multicultural city which was shaped by the early colonial settlers, the Zulu population and the prominent Indian community. Your Durban City day tour begins as you cruise along the Golden-Mile (Marine Parade), the revitalised beachfront promenade which hugs the beckoning beaches of Durban. 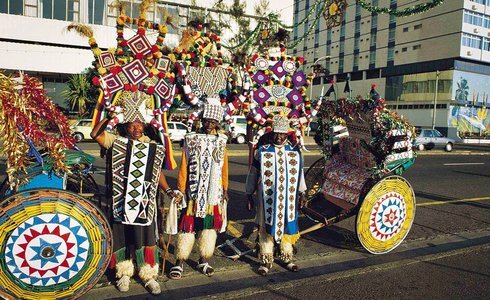 You'll have the opportunity to view Durban's Rickshaw pullers, a traditional and popular feature of the city's beachfront. Stop briefly to see Durban Harbour, the busiest in Africa. The tour continues along the Victorian Embankment, passing the Vasco da Gama Clock - a popular Durban landmark which marks the 400th anniversary of the famous Portuguese explorers first sighting of the city. Pass by the The South African Sugar Terminal, one of the largest of its kind in the world, where sugar from the silos is loaded onto cargo ships and transported from Durban's harbour to various destinations across the globe. Your tour will continue to the University of Natal and on to the lush tropical Durban Botanical Gardens. Founded in 1849 with its splendid orchid house, Durban Botanical Gardens is a treasure trove of massive trees, offering spectacular photographic opportunities. Adding a touch of spice to your Durban holiday, visit the colourful India market where you'll be able to shop for saris, beaded dolls, woven baskets, oriental ceramics and curries and spices, of course.